We should not be afraid of dying, but modern society sees this as a failure. This is a subject I have been banging on about for 25+ years. 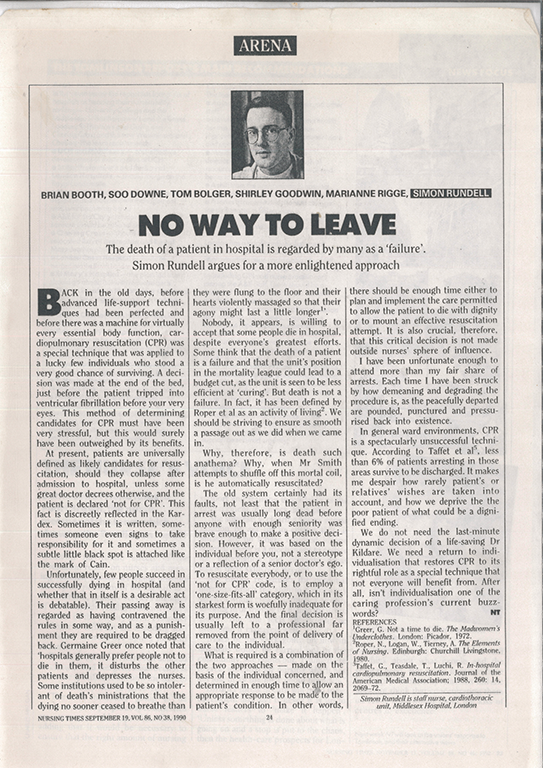 The article on the right was written in 1990 by a Staff Nurse in a Coronary Care Unit (with hair, note!) who felt that we applied the indigities of resuscitation far too indiscriminately. As one who jumped on chests on a daily basis, I saw first hand where it worked and its importance. I was also very aware of its abuses because we were too reticent to tell people that their loved ones were dying and that they should not be afraid. This video, a short think-piece by a specialist in care for the dying (thanatology) , I feel, should be more widely seen as it explains rather beautifully the gentle process of dying which is natural. I would want also to bring the spiritual dimension into this, and speak of the need for words of comfort, reassurance, of making peace and receiving absolution, and where appropriate the sacraments. The Oil of Healing might heal us to a good death – a Euthanasia – which is the perfect end. That word has come to mean something very different, very clinical; but I ask you: would we not all want a good death? A euthanasia? Specialists can ensure that death is peaceful, pain-free and stress-free. But you have to let them do their work. “Do all you can” is usually more for our benefit as the ones who remain behind, unable to grasp the reality that death will ultimately visit us all. It isn’t true that “Death is nothing at all”, for the bereavement it leaves behind can be devastating, but we should be assured that death is a part of life, an inescapable part of reality and a frame around which our lives have meaning and context. What we do on this earth matters: the people we love, the laughter we share, the lives we impact. But it will not last for ever, and there is a time for that to end, and time for subsequent generations to take up the baton. Learning to live with and beyond the loss of someone we love does not mean you have failed them, but that we adjust to that loss .